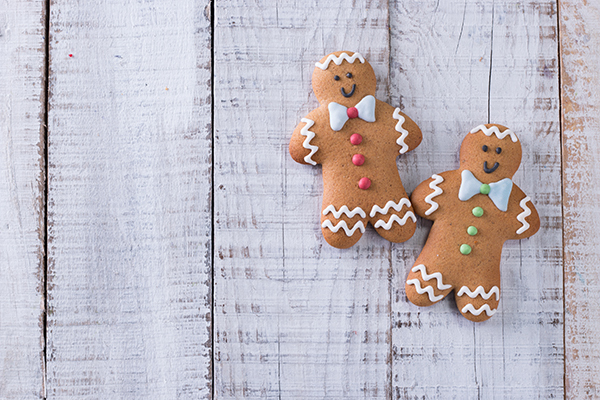 Christmas is all about family, friends… and baking! There is no better time to get baking than at Christmas, but if you suffer from food intolerance Christmas can also be a time of stress and tummy aches. Preparing your food with Biohawk can help reduce those nasty side effects. Explore our Christmas recipes for gingerbread, puddings, cakes, shortbread, mince pies and more. We even have a recipe for the perfect Christmas ham! plain flour sifted 3 times with 1/8 teaspoon Bake Aid OR alternatively use Gluten Free Plain Flour or Rice Flour. Preheat oven to 180°C. Line 3 baking trays with baking paper. Heat butter, golden syrup and sugar in a saucepan until butter has melted. Stir to combine. Allow to cool slightly. Sift flour with Bake Aid once, add ground ginger and bicarbonate of soda and sift twice more into a bowl. Stir in the butter mixture, egg and vanilla essence. Press together to form a dough. Cover with plastic wrap and chill for 10 minutes. Knead dough lightly on a floured surface. Roll dough to a 5mm thickness and cut into shapes with cookie cutters. Place on the prepared trays and bake for 10 minutes or until golden. Cool on trays.